Prevention of Electronic Crimes Act. 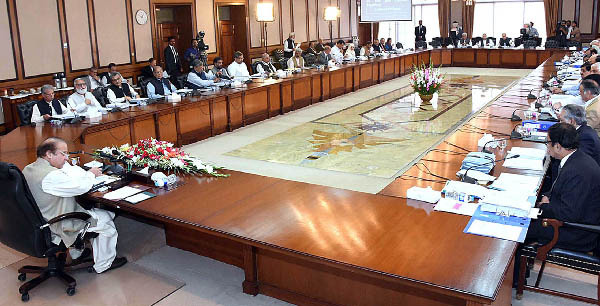 These included approval of the Minutes of the last Cabinet Meeting, Land Acquisition for Diamer-Basha Dam: Compensation Rates of Barren Land, Chilas and Agreement between Indonesia and Pakistan on Cooperative Activities in the Field of Defence. on General Cooperation in Expertise and Knowledge Exchange in the field of Banking and Finance. SAARC Limited Multilateral Agreement on Avoidance of Double Taxation and Mutual Administrative Assistance in Tax Matters, while permission to start negotiations in principle with the Belarus for Entering into Memorandum of Understanding on Exchange of Customs Trade Data Statistics, was also accorded. Economic Coordination Committee of the Cabinet (ECC) during 2013, 2014, 2015 and 2016. Coordination Committee of the Cabinet on Energy (CCE), and those taken by the Cabinet Committee on Privatization (CCOP) in its meeting held on 10, 13 February, 09, 24 & 26 March and 06 & 11 April, 2015.
and 22-02-2016, and those taken by the Economic Coordination Committee of the Cabinet (ECC) held on 07-09-2016.